Kass is a beautiful bright bay gelding, 83.05% Crabbet. 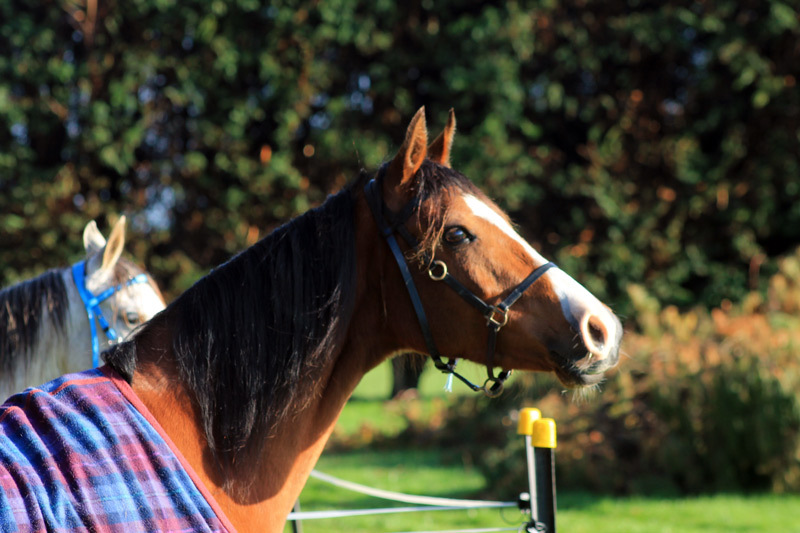 His sire, Silver Omen (15.1hh), is pure Crabbet and his dam, Koa (14.2hh), is a mix of Polish-Crabbet breeding. Kass has matured to about 15hh. Kass has Omen’s fantastic temperament, is correct in the legs and is a lovely mover with fabulous hock and knee action. He is a super comfortable ride, and loves to take the lead. He is a full brother to Kool Kat. Just before successfully completing his first 80km ride for us in November 2015, Kass was sold to young Canterbury rider Alice King, of Loburn. Kass, at right, with Merlin, November 13, 2013. Kass and Merts, November 13, 2013. Give way: one lane bridge! – February 22, 2014. The team on the trail – February 22, 2014. Kassanova and Robin at front, with Merlin and Lyn, head for the start line., February 2, 2014.